Leaders in Energy is building a community of engaged leaders to advance clean energy and sustainable solutions. Our work aims to connect a number of key stakeholders with aligned interests to advance our mission in our key areas of focus including sustainable communities, the green economy (jobs and finance), and multigenerational leadership. We connect job seekers to hiring managers and employers, energy suppliers with solutions to the market (including business and consumers); technology and social innovators to investors; and industry experts with our action network. See the diagram below with our stakeholder community. 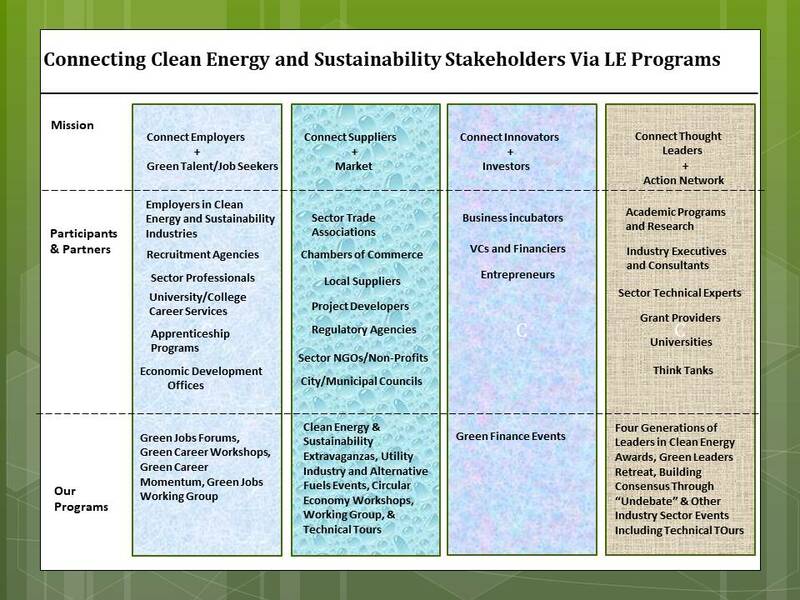 Leaders in Energy serves as a platform to help our community of members and sponsors connect with one another on opportunities that lead to creating impact by mobilizing talent and resources for the green economy as well as increasing transactions that to help build the green economy through goods and services. Conduct professional and educational networking events, workshops, and working groups. Learn more about our Circular Economy Working Group here. We also have a Green Jobs Working Group which is researching the needs of employers and green jobs seekers. Learn more on how to participate by sending a message to info@leadersinenergy.org.